Festival co-organizer and owner of Cat Head Delta Blues and Folk Art, Roger Stolle, commented on this year's festival. "The first acts we book are our region's older, culturally-connected blues performers, then, we spread out from there. There is an insane number of blues musicians in town during Juke Fest week! It's like no other event in the world." The other festival organizer, Nan Hughes, describes it thusly, "Juke Joint Festival is half blues festival, half small-town fair and all about the Delta." The festival runs for a long weekend. It gets started on Thursday and runs through Sunday. The actual festival is officially Saturday and requires a wristband. That will be the best entertainment you will ever buy for $15. Thursday, Friday and Sunday are filled with free events. All of the local venues in any way related to the Blues and many that have no relationship all provide stages for the street musicians either inside the buildings or out front. The musicians range from 16-yr-old blues guitarist Christone Ingram who calls himself Kingfish to 93-yr-old Henry "Gip" Gipson who owns his own juke joint near Birmingham. AL. We arrived Friday and made our first stop at the Rock and Blues Museum. Owner Theo Dasbach, who is also an accomplished musician, greeted us and led us around his pride and joy. Seeing all these musical artifacts, many from long-dead famous musicians really got us in the mood to hear some real blues. We didn't have far to go. 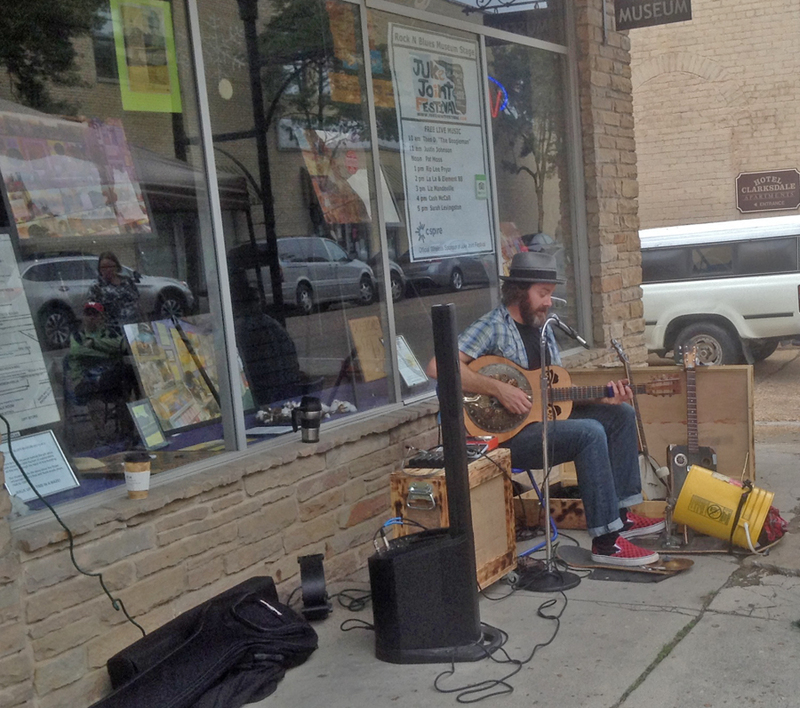 Right in front of the museum there was a lone bluesman, Lou Shields, playing his heart out. He has released 2 full length, 12 EP recordings and has been making music for over 20 years. Since he loves the Blues, he came all the way from Chicago for the Juke Joint Festival. 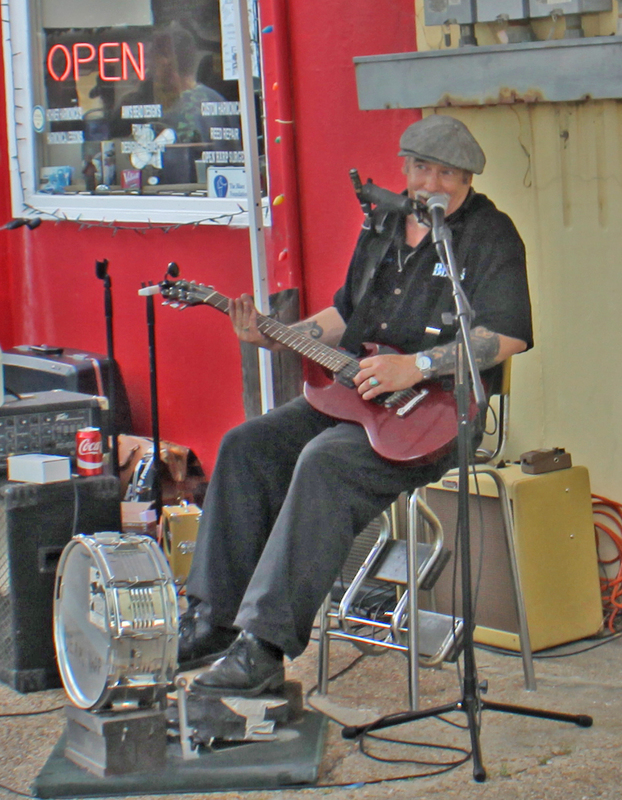 Rock and Blues Museum features the free Second Street Blues Party on festival Sunday. 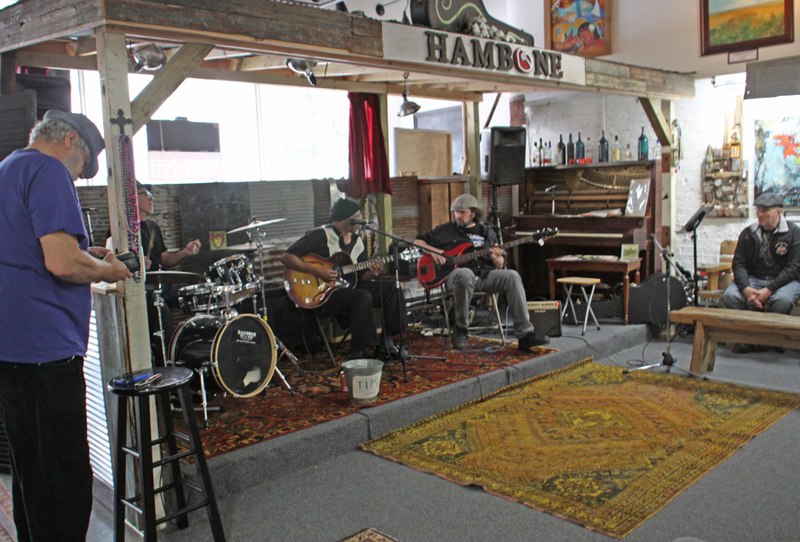 Right next door at the Hambone Art Gallery there was an indoor stage. When we stepped in Blues Guitarist Selwyn Cooler and his band was going strong. The walls are filled with owner Stan Street's colorful art depicting mainly his vision of the Blues. It's an inside look as he is also a talented Blues musician. Down the street a bit I came upon Deak Harp playing next to his store, Deak's Mississippi Saxophones and Blues Emporium. Deak is really versatile and does a one man band. 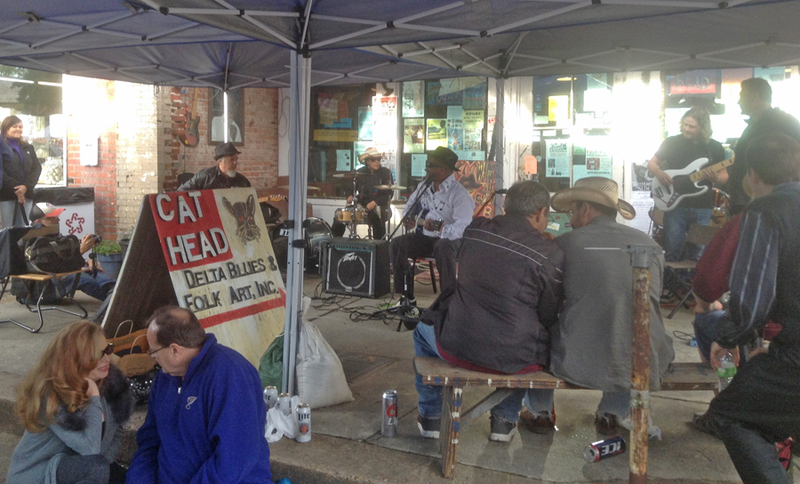 Just a few blocks away, Cat Head Delta Blues & Folk Art had live Blues going strong. I was really impressed with the band there. Rev. KM Williams doing the vocal honors and Washboard Jackson and Trainwreck backing him up. Rosalind Wilcox was backing up the percussion end when I caught the band She is the coolest ever on the drums. Washboard Jackson, the regular drummer, played later and I heard he was great as well. 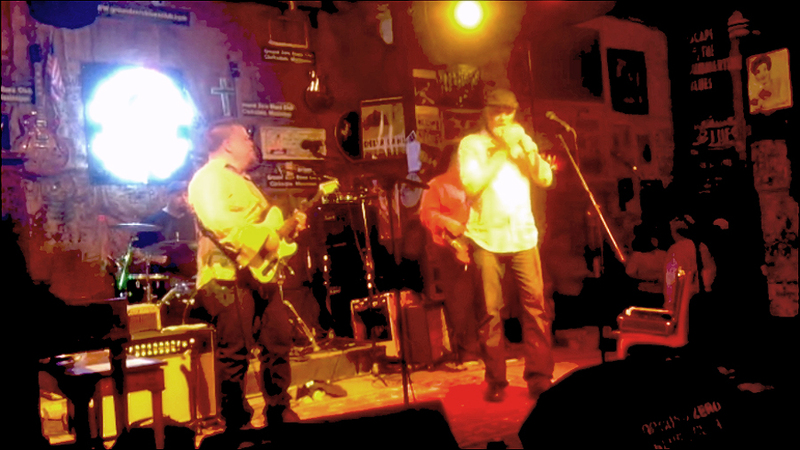 Jeff Stone on harmonica, Scott Linsey and Jeff Dale on guitar. Cat Head Mini Blues Fest is their free Sunday event starting at 10am. Cat Head Delta Blues & Folk Art has been called "one of the 17th coolest record stores in America" by Paste Magazine and one of the "1000 Places To See Before You Die" by Workman Publishing. It is a recipient of the Blues Foundation's "Keeping the Blues Alive Award". Ground Zero was where we headed for supper and some more hot licks. I enjoyed the tamales and coleslaw while several others praised the Pulled Pork BBQ on a Bun. The "Homewrecker Chicken Sammich" sounded interesting just because of the name. There is a full bar and the music was loud and good. We got to hear Mothman and Stacey Michhart. Mothman is a four man band consisting of Chuck Queen playing bass and keys, Todd Martin on guitar and vocals, Jeffrey Lewis played drums and did some of the vocals and Jason Burton on the all important in Blues harmonica as well as keys and vocals. Stacey Michhart plays a mean guitar. He has been awarded "Albert King Most Promising Guitarist Award" at the Blues Foundation's International Challenge in Memphis. Ground Zero has been named as "Top 100 Bars and Nightclubs in America" and featured in National Geographic and many of the top publications in the country. Another purely Delta place to stay is the Shack Up Inn. They will tell up front " The Ritz we ain't." What they are is Hopson Cotton Plantation, an authentic remnant of the way of life many Bluesmen experienced. The lodgings are sharecropper shacks and renovated bins in the cotton gin. They have upgraded all to a reasonable level of 21th century expectations. They even have a Juke Joint Chapel Bar which host some Blues Musicians for the festival weekend. The Delta Blues Museum is just across the street from Ground Zero so naturally we toured that. Loved the museum for the great number of Blues memorabilia and information about the musicians. Hated that we weren't allowed to take any photos to show it to you. We visited on Saturday morning and the band was already setting up on the porch. Across the lot you can see all the tents for the exhibitors. There is more to the festival than music. 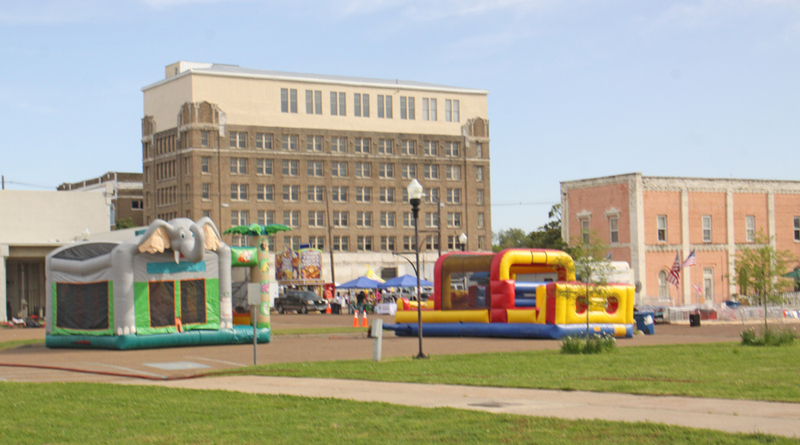 you will find tents set up to exhibit everything from animal rescue to Clarksdale/Coahoma County Tourism Commission. 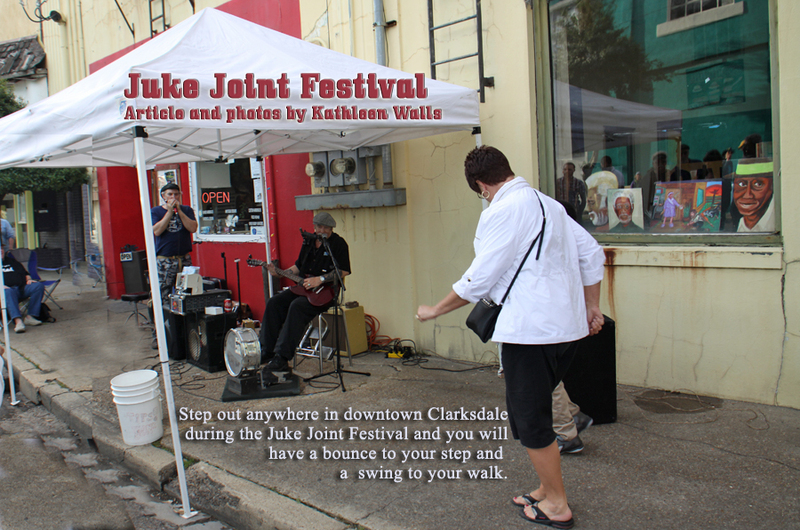 The latter is the perfect place to start your adventure as they can give you the lowdown on all the places to see in Clarksville besides the Juke Joint Festival. Naturally there are food venders ranging from cupcakes to barbecue. Art of every kind can be found from folk art, recycled art, fine art, photos, jewelry and even handcrafted cigar box guitars. There are races, writing contest, art contests and even a pig race. 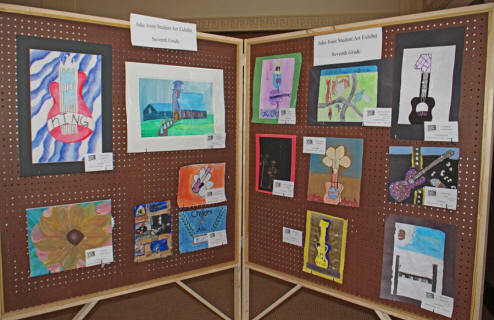 Entries in an art competition are displayed at The Bank Building. Don't go looking for a traditional building with a drive-through and an atm. This is a Neoclassical/Beaux Arts style marble building that was originally the "Bank of Clarksdale" built in 1930 and now used as an events venue. With its skylights, marble counters and highly decorative interior ceiling that stretches skyward far more than any modern building, it is a perfect place for the reception for international visitors with the Welcome Home Aussie Party. 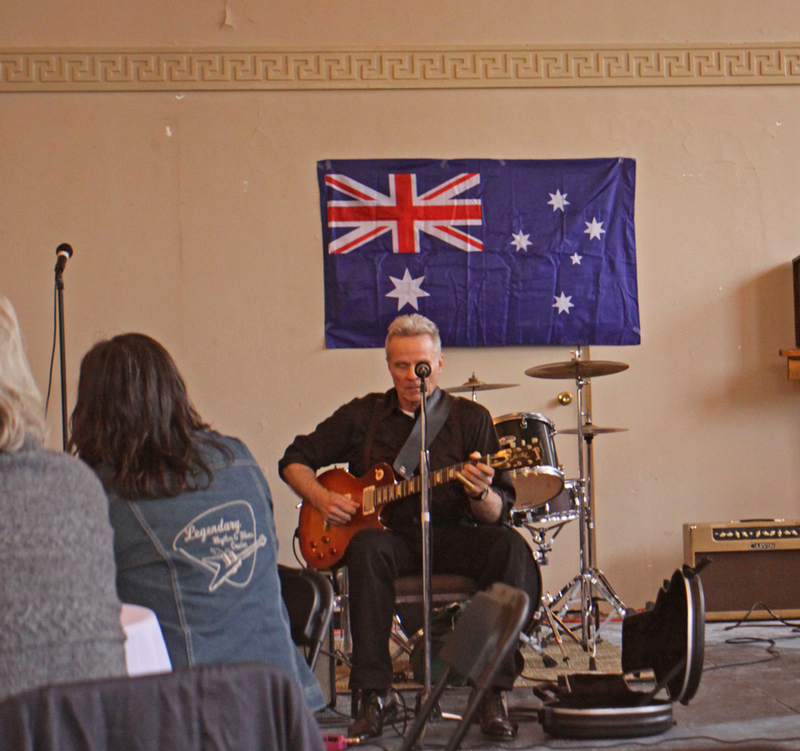 Yup, Blues are big internationally and draw a good crowd of visitors from Down Under and all over. The band takes center stage. When I arrived, Preston Rumbaugh was playing guitar. The hors-d'oeuvre, wine and cash bar are to one side and the Festival Art Contest entries are displayed on the other side. I thought the art was pretty interesting for non-professionals. The judging was divided based on grade level. 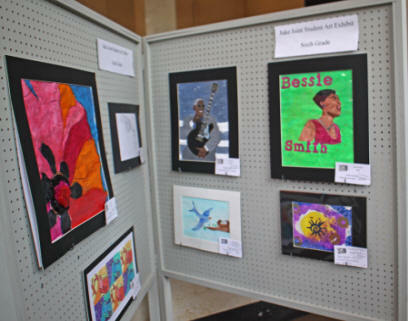 The subject matter ranged from lots of guitars and crossroads to a close up portrait of Bessie Smith done by a sixth grader with a lot of talent. incidentally, Bessie Smith died in Clarksdale in 1937. She was taken to The Afro-American Hospital after a fatal car crash on Highway 61 and died the following morning. The hospital, now the Riverside Hotel, is the site of the fourth marker on the Mississippi Blues Trail.